A report from the state Department of Education found that public charter schools and magnet schools operated by Regional Educational Service Centers (RESCs) have helped inner-city students achieve higher academic proficiency than their peers in the public school system. The education department, which analyzed data from a 3rd to 5th grade and 6th to 8th grade cohort for their report, drew their findings from comparing the Connecticut Mastery Test scores of urban students in non-Choice schools, public charter schools, magnet school populated by students from local districts, magnet schools operated by RESCs, and the Open Choice program. The data concluded that, in the 3rd to 5th grade cohort, magnet schools operated by RESCs performed best at closing the academic achievement gap. In this cohort, the Open Choice schools program and the magnet schools operated by local districts were the second- and third-best performing, respectively. The public charter school system, however, remained the worst performer in the 3rd to 5th grade cohort. 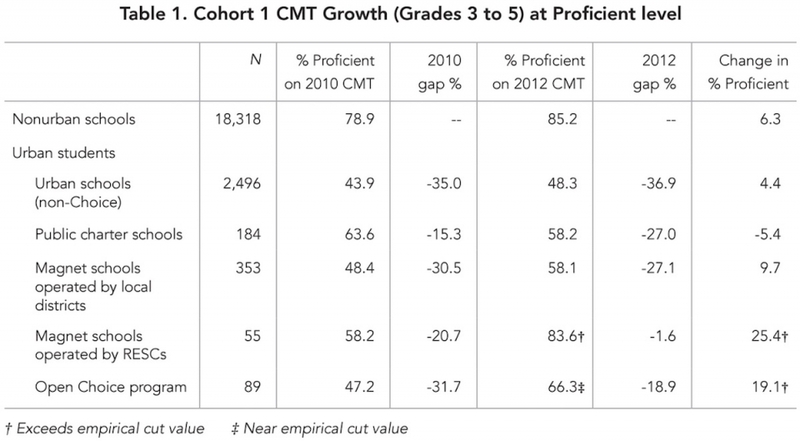 The authors of the report called this “puzzling,” as the public charter school system proved to be the best option for CMT takers in the 6th to 8th grade cohort, followed by magnet schools operated by RESCs. However, despite the unyielding language of the report, the data provides little clarity. So the question remains — are charter and magnet schools really a better academic option than their public counterparts? In a state that has the worst achievement gap in the nation, this debate has continuously plagued Connecticut lawmakers and citizens alike. The controversy recently became revitalized when Democratic lawmakers learned of Malloy’s insistence to allocate $4.6 million of the recently-approved $40.3 billion state budget to fund two new charter schools. Charter school advocates such as Malloy argue that students in Connecticut’s charter schools perform better on standardized tests than their public school counterparts, while proponents like Connecticut Coalition for Achievement Now, a group dedicated to improving education options for the state’s youth, continue to voice support for giving parents of students in underperforming schools the high-quality options they deserve. However, opponents of the expansion, such as Rep. Ezequiel Santiago, D-Bridgeport, believe the charter school system to be stripping funds from public schools that are already floundering. According to Santiago, public schools are like a large ship that has a crack in the hull — he said 95 percent of the students are on board and instead of funding appropriate repairs, they decided to take a few students off and put them in a charter school lifeboat. State Rep. Ed Vargas, on the floor of the House during debate over legislation to change the way charter schools are governed, took the analogy a step further by saying that rather than repairing the ship, the governor wants to build two new lifeboats to save some of the students, instead of all of them. Vargas, a Hartford Democrat who taught for 35 years, said that charters started out as a way to experiment with new teaching techniques without being limited by public school bureaucracy. But lately, Vargas said, they have instead been trying to compete with public schools for funding. Those concerns are not unfounded — under the education reform legislation passed in 2012, the Achievement First, a charter school with campuses in Bridgeport, Hartford and New Haven, has seen an increase in state funding of $2,600 per student while the average student in 30 poorer districts has seen an increase of an average of $150 per student, according to the AFT-CT website. This information is part of a report compiled by AFT Connecticut, the state’s second largest teacher union. The report also includes data on the increased racial segregation of charter schools. Moreover, the Connecticut Voices for Children report found that charter schools’ results may be linked to the fact that they have a financial incentive to exclude English Language-Learner students, as the schools would have to pay out-of-pocket for the ELL programs, and disabled students, as the schools have no specific diversity requirements. However, despite their heavily-reported flaws, it is largely undeniable that, like the Education Department report suggests, Connecticut’s charter school system fosters academically-successful students, thus bringing the state closer to closing it’s mile-wide achievement gap. Above all, the Education Department report made the need for more research clear. “This analysis provides an important benchmark for evaluating Connecticut’s Choice programs,” the report states. When Connecticut high school senior Akbar Maliki looks back on his high school experience, he can think of only one negative: his school has made him so open to and accepting of diversity, he says, that he worries about his ability to make friends with people from too-similar backgrounds. "I'm always going to be looking for the next diverse group. It's hard for me to be surrounded by the same types of people," Maliki, who moved to the United States from Indonesia as a child, told The Huffington Post. Unlike so many around the country, Maliki's school is deliberately diverse. Its student body is slightly over half black, about a quarter white, 16 percent Hispanic. Nearly half of its students are eligible for free or reduced price lunch. When Maliki looks around his lunchroom, he sees "every race," he said. "It's not like, just the white kids sitting at one table or black kids at one table." Maliki is set to graduate from Metropolitan Learning Center in Bloomfield this spring. Metropolitan is one of Connecticut's 84 magnet schools designed to bring together students from different socioeconomic backgrounds. These magnet schools make Connecticut a rare exception in a region that increasingly accepts racially isolated schools as inevitable. "It is the only state in the Northeast that is going in a positive direction and it has created voluntary processes that have clearly reduced severe segregation in a time devoid of national leadership," an April report from UCLA's Civil Rights Project found. "This is a solid accomplishment that the state should be proud of and other states should look at as an example." Sunday marks the 61st anniversary of the landmark Supreme Court decision, Brown v. Board of Education, the case that declared intentionally segregated schools unconstitutional and set off a wave of efforts to increase school diversity. For years following the case, court-ordered interventions boosted school integration. However, since a string of court decisions allowed states to relax these efforts, the number of students in intensely segregated schools has risen since the late '80s and '90s. Connecticut stands as a unique deviation from this trend. In 1996, a decision in the state's Supreme Court in a case called Sheff v. O'Neill ruled that "racial and ethnic segregation has a pervasive and invidious impact on schools," and ordered the governor and state legislature to find a solution. In 2003 the legislature created a system to fund regional magnet schools and a voluntary interdistrict transfer system. The transfer system allows a small number of urban students to attend suburban schools and vice versa -- something atypical in traditional public schools, where students usually live close to the school they attend. The magnet schools draw from students in both urban and suburban districts through a lottery. About 40,000 Connecticut students currently attend a regional magnet school, according to the UCLA report. In 1987, about 16.4 percent of black students in the state attended schools that were nearly 100 percent minority. Now, about 4.2 percent of black students do. Maliki attends one of 19 magnets schools managed by Connecticut's Capitol Region Education Council. Overall, CREC schools serve a population that is 32 percent white, 28 percent black and 27 percent Hispanic. Some 48 percent of CREC students are eligible for free and reduced price lunch. Connecticut still has some of the country's largest achievement gaps between socioeconomic and racial groups of students. While CREC's white students still outperform black and Hispanic students on statewide tests, achievement gaps in the 19 magnet schools it manages are much smaller than they are in the state overall. In at least one case, the gap reversed. "For our children in the fifth grade last year, Hispanic children outperformed all other children," said Bruce Douglas, executive director of CREC. "There's another achievement gap now, between Hispanics and whites." Connecticut's efforts -- in contrast with other states that have attempted to desegregate schools amid court orders -- have received relatively little pushback, said Gary Orfield, co-author of the UCLA report. "No white student is forced to do anything, no white family is; they all get additional choices which are good educational choices," Orfield told HuffPost. "It's a win-win situation." "The fact that its all voluntary makes it much easier," he said. "Also much more incomplete." But not everyone is convinced that these expensive new schools are worth the investment. Connecticut's legislature in 2009 imposed a moratorium on building new magnets in the state, except in Hartford, due to budget constraints. Some legislators say there isn't enough evidence to prove that these schools are improving academic achievement. Others say the complicated funding system for magnet schools takes money away from traditional public schools, although Douglas disputes this. "The state is not well served by building expensive new schools," state Rep. Andy Fleischmann, who chairs the legislature's education committee, told The Connecticut Mirror in January. Flesichmann did not respond to a request for comment. Connecticut has invested more than $2 billion over the last two decades in these types of schools. "That's an enormous amount of money, and there have been very little indicators it's working to improve student achievement," Casey Cobb, a professor of educational leadership at the University of Connecticut's Neag School of Education, told The Mirror. "They haven't invested one iota on research, which is stunning since the've invested so much on programming." Among families, demand for these schools is high. "This coming year there's about 2,000 seats available in our magnet schools," said Douglas. "We have 20,000 applications. That should send somebody a message about demand." Connecticut has proven this model can work, said Orfield. States shouldn't merely accept the idea that segregation is unavoidable. "It's pathetic that only one little state is showing any leadership ... all this data from No Child Left Behind consistently identifies schools segregated by race and poverty. Those are the dropout factory schools," Orfield said. "It shouldn't be so radical to think it might be better to have more diverse schools." The Connecticut Coalition for Magnet Schools held a Legislative Action Day at the Legislative Office Building on April 13, 2015. Over 125 parents, students, and teachers joined their voices to fight for fair and sustainable funding for all Connecticut’s magnet schools. During the event, advocates met with their representatives and senators to share their personal success stories, including why they chose a magnet school education and what their magnet school means to them. Advocates asked legislators to increase the state’s funding for magnet schools, implement a sustainable funding formula for magnet schools, and improve access to magnet schools through increased transportation reimbursement. At a Public Hearing of the Appropriations Committee, hundreds of people brave the storm in support of great magnet schools. The sea of orange shirts at the Legislative Office Building had a huge impact on Connecticut’s legislators and on the education community. The hearing was on the subject of the budget for Elementary & Secondary Education State Agencies. 13 students, as well as 45 parent and teachers signed up to testify, with some supporters staying until 10 PM. The Connecticut Coalition for Magnet Schools will hold a press conference on February 3, 2015 to announce its legislative priorities for 2015. The newly-formed coalition is comprised of families and community members from throughout Connecticut, and it is working with local organizations, school districts, and associations to ensure that magnet schools have the funding needed to continue to provide high-quality teachers and essential programs in diverse magnet school communities. The group is also working to ensure that all students have equal access to magnet schools and that magnet school programs continue to serve a diverse population of students.